Last night I watched A Thousand Words movie and it made me think. If I was limited to only saying a thousand words, what would they be? This movie is both a comedy with a bit of drama. But more importantly, this movie has a great message. Slow down, listen to others, say what you mean, and use words wisely. I’m not a movie critic so I’m not one to analyze characters, plot, etc. however this movie is one that you must watch and really think about the message it gives. 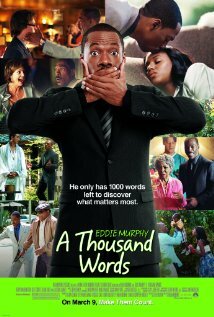 How would you use your last thousand words? I love movies. I would watch movies everyday, all day, if I could. The range of movies I like is pretty wide – scary movies to animated movies. Although I watch all types of movies, I tend to hum and haw when it comes to romantic movies because it is depressing and reminds me that I’m alone and will probably never have a “happily ever after” like most romantic movies do. But I still watch them so I can dream of that life even if they leave me feeling alone and sad. But when it comes to sad movies, I like them but then I don’t. Right now there are three movies so far that have made me cry uncontrollably. 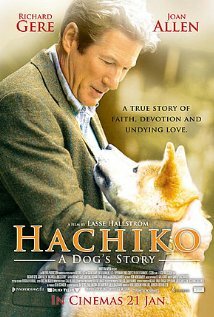 Last night my mom and I watched a Netflix Instant Play movie called Hachi: A Dog’s Tale. The movie is in the category of Children and Family starring Richard Gere. I haven’t cried like this in many years. All I could think about was my own dog Sadie doing that and it broke my heart. My mom was walking down the stairs to her living area and I wrapped my arms around Sadie and said something to her (that I can’t say here otherwise I will spoil the movie), but it made my mom start crying again. The only way I was able to stop crying was to continue reading my book like I do every night when I crawl into bed. Sounds pathetic I know, but as awesome as this movie was, it was equally sad. If you’re a dog lover I still recommend this movie but highly suggest having tissues available. If you don’t cry then definitely see this movie because it was sooooo good. 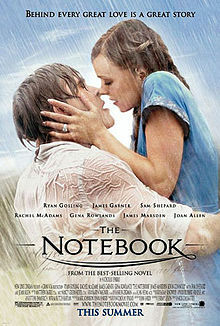 Oh my gosh….then we have The Notebook. When I watched this movie, it was around the same time that my mom and I suspected my grandma might have Alzheimers. So when the end of this movie approached and unraveled, let me just tell you that the waterworks took over. My mom and I watched it together and we couldn’t stop crying even after the credits finished. We were both a mess. But this movie in my opinion is one of the best love stories I’ve ever seen. 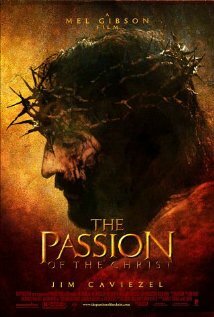 The final movie for now is Passion of the Christ. I went to see it years and years ago with some girlfriends at a movie theater. Not sure why we thought that was a good idea. When the really horrible torture parts appeared, I remember looking up at the ceiling of the theater and crying. I was trying to keep my chest convulsions to a minimum since I was with friends AND in a public place. I won’t see this movie EVER again, but I’m glad I saw it once.